(CNN) -- NASA said Friday it had discovered water on the moon, opening "a new chapter" that could allow for the development of a lunar space station. The discovery was announced by project scientist Anthony Colaprete at a midday news conference. "I'm here today to tell you that indeed, yes, we found water. And we didn't find just a little bit; we found a significant amount" -- about a dozen, two-gallon bucketfuls, he said, holding up several white plastic containers. The find is based on preliminary data collected when the Lunar Crater Observation and Sensing Satellite, or LCROSS, intentionally crashed October 9 into the permanently shadowed region of Cabeus crater near the moon's south pole. 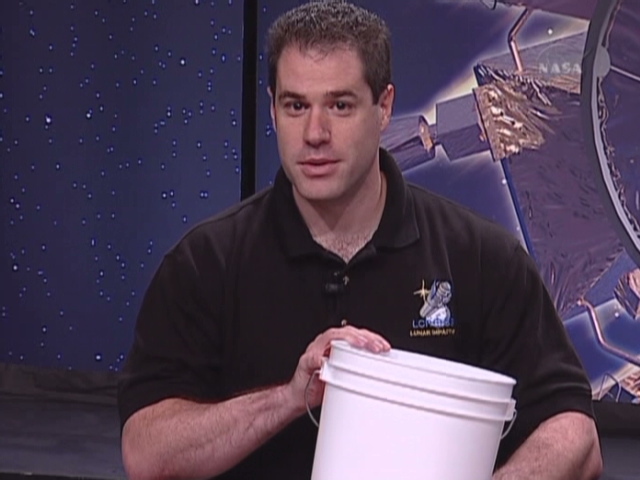 After the satellite struck, a rocket flew through the debris cloud, measuring the amount of water and providing a host of other data, Colaprete said. The project team concentrated on data from the satellite's spectrometers, which provide the best information about the presence of water, Colaprete said. A spectrometer helps identify the composition of materials by examining light they emit or absorb. Although the goal of the $79 million mission was to determine whether there is water on the moon, discoveries in other areas are expected as studies progress, Colaprete and other scientists said at the briefing at NASA's Ames Research Center at Moffett Field near San Francisco, California. "The discovery opens a new chapter in our understanding of the moon," the space agency said in a written statement shortly after the briefing began. Michael Wargo, chief lunar scientist at NASA headquarters in Washington, said the latest discovery also could unlock the mysteries of the solar system. He listed several options as sources for the water, including solar winds, comets, giant molecular clouds or even the moon itself through some kind of internal activity. The Earth also may have a role, Wargo said. "If the water that was formed or deposited is billions of years old, these polar cold traps could hold a key to the history and evolution of the solar system, much as an ice core sample taken on Earth reveals ancient data," NASA said in its statement. "In addition, water and other compounds represent potential resources that could sustain future lunar exploration."